This campaign is one part of our larger national strategy to fulfill our mission of eliminating racism. Founded by YWCA Trenton and YWCA Princeton in 2007, Stand Against Racism quickly grew to a national presence by 2010, when an additional 80 YWCAs across the nation participated. 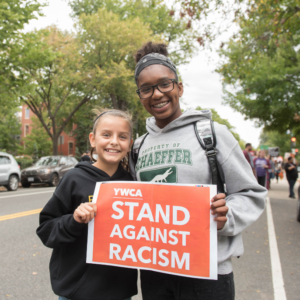 In 2018, over 470 Stand Against Racism events were held nationwide, in nearly every state. Participants included over 190 YWCAs, as well as state and local governments, schools, nonprofit organizations, various companies and small businesses, houses of worship, and more. Last year’s campaign also featured over 20 national partner organizations, including the United State of Women, Moms Rising, the American Constitution Society, Planned Parenthood, the Women’s March, and others.